Well, now that the long weekend (or "final" weekend of Summer if you're cynical) has arrived with it's inevitable backyard shindigs and school lunch-planning moms, my mind is turning to quick to eat (and especially packable) fare. It's still nice and hot outside, which means outdoor-friendly food and platters get top billing - precisely what this week's #SundaySupper is all about. I decided to take a little bit of a healthier twist on the dessert tray though, as delicious as all the cakes, quickbreads and brownies I've been churning out are. I'm no raw foodist, but I do know that dates make fabulous sweeteners and rich tasting desserts - especially paired with chocolate. Luckily, I had some help on the recipe front, being inspired by Jenna Zoe’s book Super Healthy Snacks and Treats: More Than 60 Easy Recipes for Energizing, Delicious Snacks Free From Gluten, Dairy, Refined Sugar and Eggs. Rather than the (admittedly decadent) combination of cream, butter and sugar commonly filling caramels (and especially truffles! ), these are composed of sticky, sweet and rich dates, maca powder and tahini with a pinch of salt. That's it... no accoutrements necessary really, but since I can't not have a chocolate treat every day, they're dunked in a stevia-sweetened dark chocolate too. Yup, these bites of heaven are sugar free, nut free, gluten free and vegan. Can we say yum? I'm not a closet chocoholic by any means - from 99% to 50%, give me a bar and I am one happy camper. 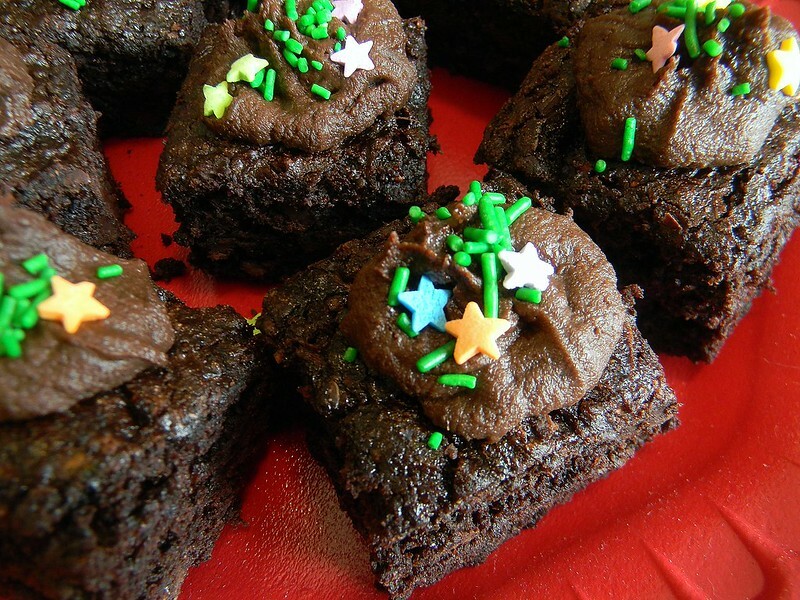 I've been known to eat cocoa powder raw, turn oatmeal into a warm bowl of chocolate pudding for breakfast, add it to chili, granola, cookies and cakes, and of course I'm on a never ending quest for the best, richest and fudgiest brownies I can make. My day is not complete without some sort of cocoa lacing it - and sometimes my passion is so strong that my mom will ask me if I'm PMS'ing :-). Nope, I'm just a bona-fide addict, without a plan to stop the habit any time soon! That said, I'm also a huge fan of vegetables, especially when they come out of my backyard at the peak of their flavour. As much as I do love a rich square of 70% Amedei, nothing truly beats the flavour of a still-warm heirloom tomato right off the vine or perfectly grilled slabs of zucchini and eggplant harvested steps from the BBQ. These days, the garden harvest is making its way into everything, both sweet and savoury, and obviously zucchini has been getting top billing lately. It's easy to see why, though - being relatively bland it's perfect for either taste application, it's packed with moisture (perfect for making sauces, soups and baked goods), it's cheap and plentiful (even if you don't grow your own) and it's nutritious. I mean, one medium, 31-calorie zucchini has two grams of both protein and fibre, no fat or cholesterol, and 56% of your RDI of vitamin C. It's enough to give anything a health halo, really. 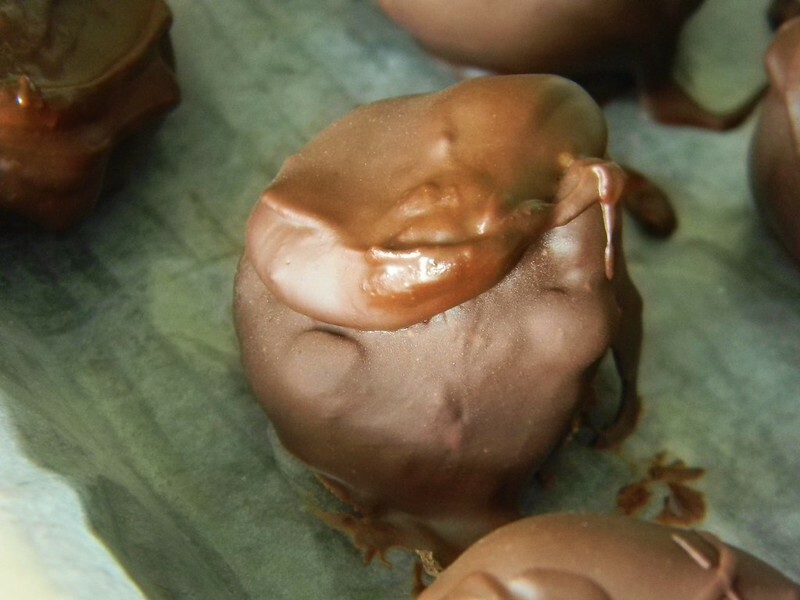 With all the summer squash at my disposal these days, I figured I could whip up some mighty fine chocolate goodies for one of my old schoolfriend's buck and doe party. 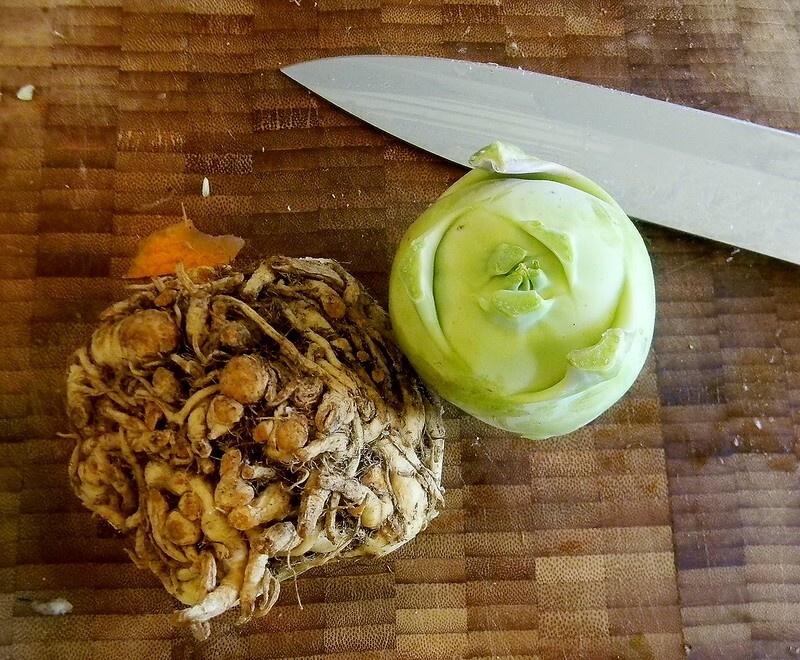 I started on a mission not only to make a "hide the vegetable" treat, but a to-die-for healthy indulgence. 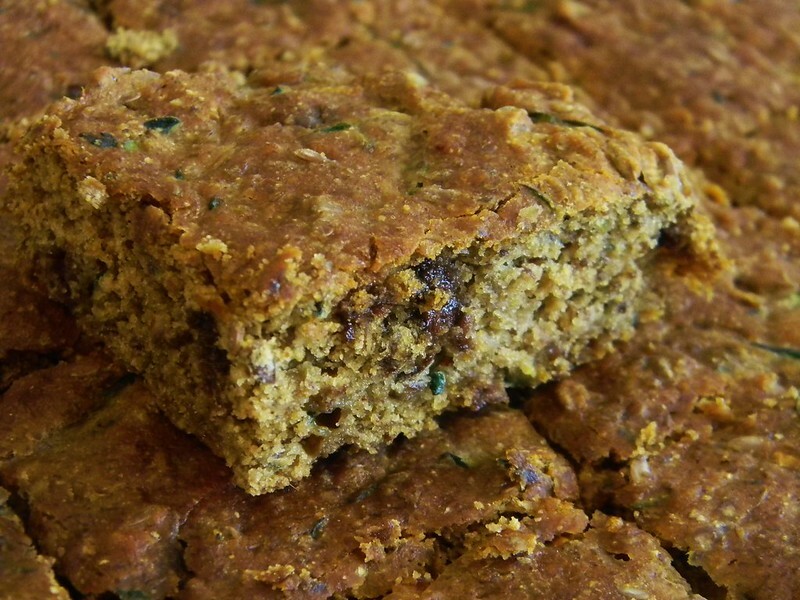 I started, obviously, with the zucchini, and cut the fat even further with pureed prunes - which add such a rich texture to the bars it's hard to believe baby food had magic - then tossed in flaxseed for the eggs, spelt flour for a delicious nuttiness and Truvia for some of the sugar. To add the "devilish" side to these (after all, it was for a party), a whole bar of bittersweet chocolate and a shot of Kahlua wove their way into the batter too, and the whole thing was frosted with dollops of my favourite Chocolate Sweet Potato Frosting. I'm giving you a break from the zucchini onslaught today. Well, sort of, since I had some pureed zucchini in the fridge nearing the end of it's useable life, and it seemed a shame to waste it when it adds such a perfect, incognito moisture to baked goods! No, instead I whipped up these dense, brownie-like snacking cake bars for a few friends who need to be either gluten free, vegan or both. 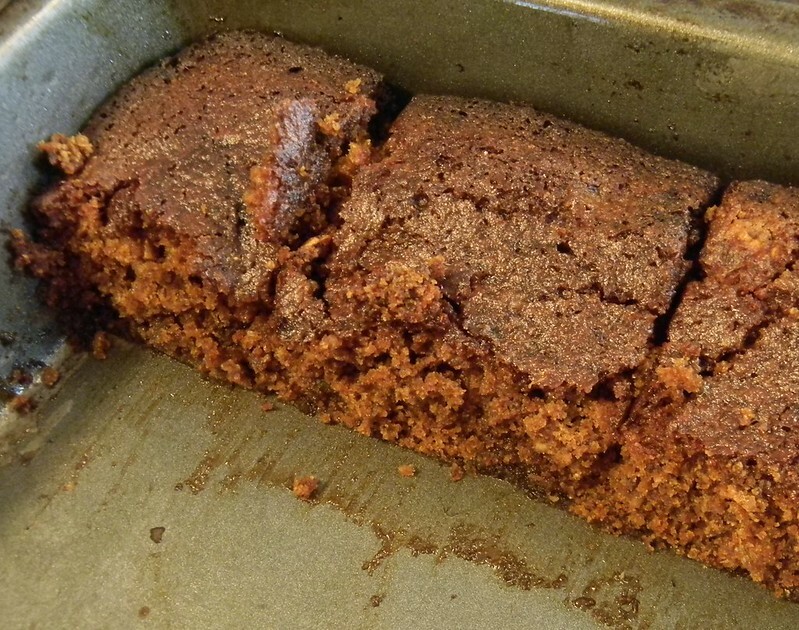 Since the chill of Fall is coming (and some would say Augtober stole any Summer we may have had anyway), I warmed things up from a standard spice cake with a double hit of ginger - fresh minced for a wallop of spicy heat, and crystallized ginger in syrup for a slower, gentler burn that is nonetheless present in every mouthful. 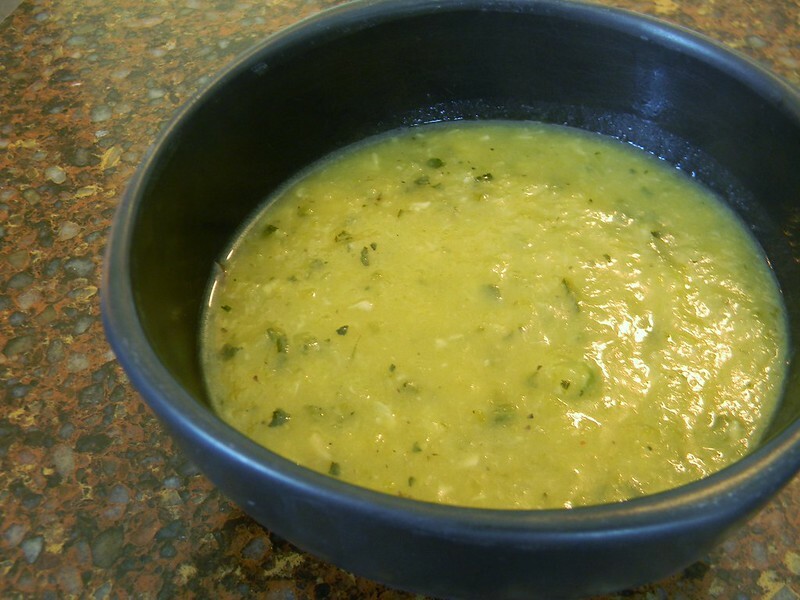 Like I said, the pureed zucchini is purely for moisture here - you could use applesauce or oil too if you want - and the slight bit of texture and flavour from ground almonds is echoes in the almond milk, adding richness to the mixture of molasses and maple syrup. 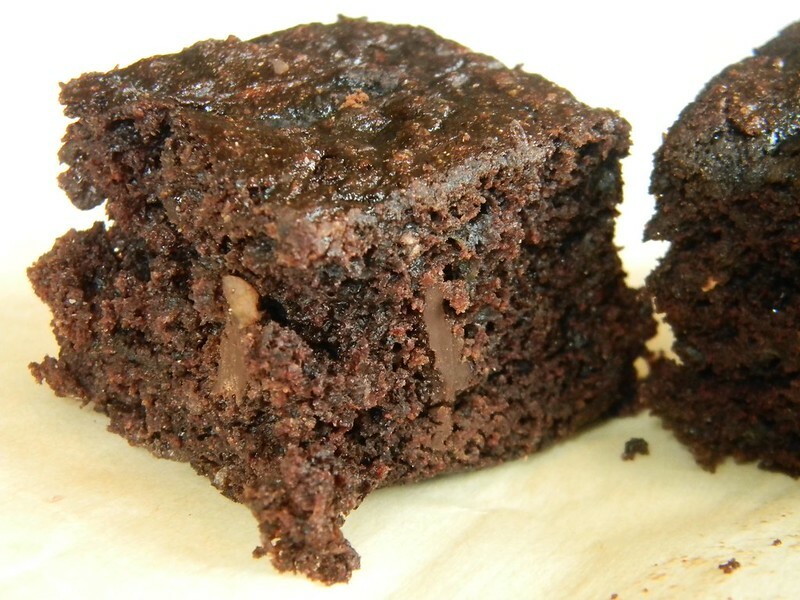 A square of this cake melts in your mouth, and save for nut allergies it will be a hit in lunchboxes and office break rooms regardless of anyone's dietary preferences (my eat-everything mom demolished the scraps). 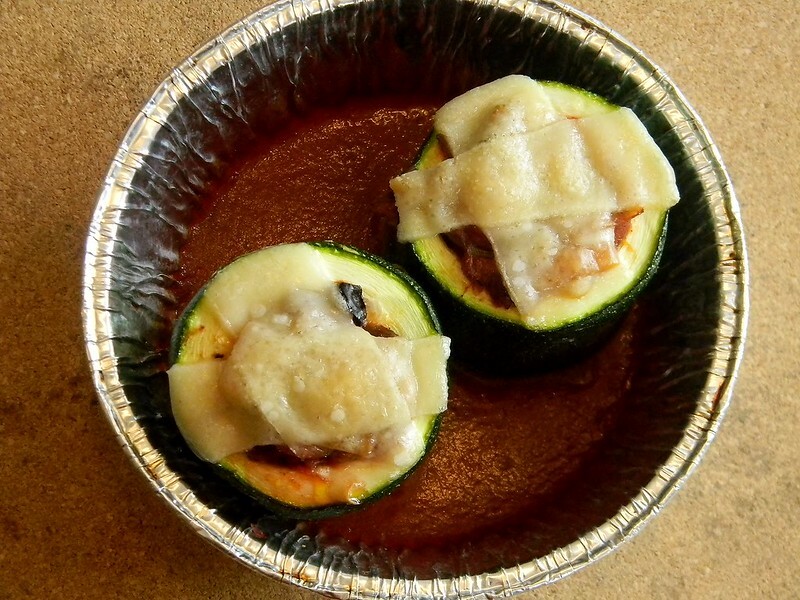 Are you sick of me posting zucchini recipes yet? Well, I hate to break it to you, but I still have a few more up my sleeve thanks to the brisk proliferation from our vines (still! ), but I did freeze a bunch of 1-cup shred "pucks" so I can meter out the remaining baking. I can't help but use the squash in everything these days, though - our growing season here is so pitifully short that I grasp every opportunity I have to savour what comes in from the backyard garden! These tender, lunch box-perfect squares were the original brainchild of Emily Mainquist, one of the Special Contributors at The Daily Meal and author of Sweet Vegan: A Collection of All Vegan, some Gluten-Free, and a Few Raw Desserts. 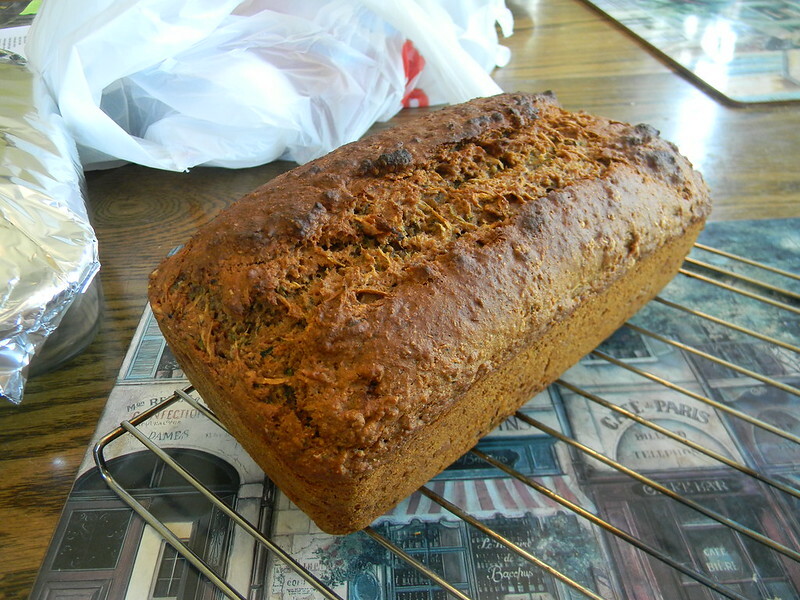 I definitely made it my own, though, pumping it full of super-healthy (and delicious) flax seed in both whole and ground forms, using stevia and agave for some of the dark brown sugar and mixing up my own flour blend rather than using a pre-mixed variety. I was also able to cut down on the oil significantly without sacrificing texture or flavour, and since I left out the nuts from the already vegan recipe the whole pan was safe to bring to school and share... not that much of that happened :-). Of course, adding in a hefty dose of chocolate certainly helped solidify the squares' lunchtime status, and the pan disappeared almost as fast as the zucchini arrived on our table! 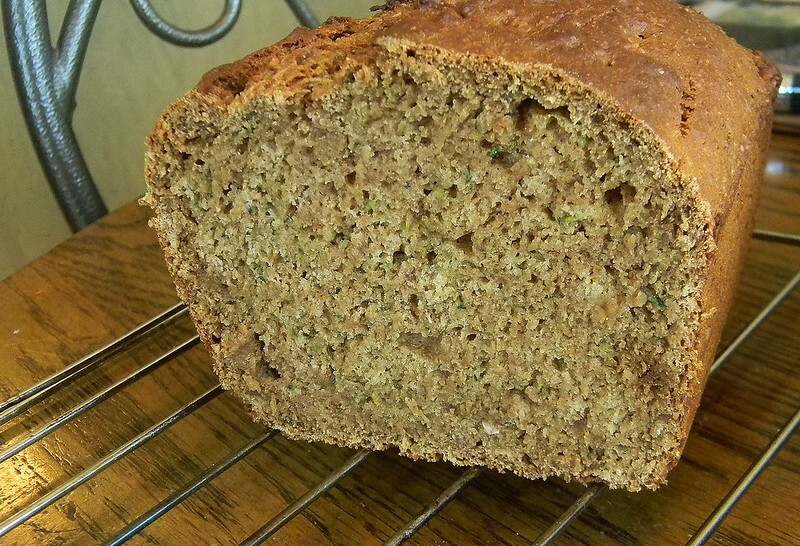 I know there are a zillion zucchini bread recipes out there. Heck, I have at least 10 on here myself, each a totally unique variation on the theme (and common goal of using up zucchini glut). If you look at a lot of these recipes, though, you'll notice they contain large amounts of oil or butter - something that always surprised me, given the veggie's inherent moisture. They also tend to include grotesque amounts of sugar - a more understandable feature, since the squash is relatively bland (and easy to hide!). I knew there was definite room for improvement on both fronts, and wanted to see if I could make the loaf vegan too. Now, replacing oil with applesauce is nothing new. Dieters have been using that trick for ages, and in general it works - with the caveat that baked goods can be a tad spongy or gummy. I've found a lot greater success using apple butter, but usually only dared swap about 2/3 of the fat for it. However, I had been using up some of our zucchini glut by making Zapple Butter, and figured I'd try the double-zucchini treatment here exclusively. That's right - there is NO added fat in this loaf, and since I was on a roll, I made it 100% whole wheat and refined sugar free. Veganizing the recipe was the easiest thing to get my head around, since I had a fresh supply of Homemade Egg Replacer on hand that worked beautifully. Even after all that modification, the bread was perfectly moist (not gummy at all! ), tender and rich tasting thanks to maple syrup, coconut sugar and a hefty dash of cinnamon and allspice accenting the nutty flavours from the coconut milk and whole wheat. It's great au naturale, warmed slightly with a dab of butter, apple butter or cream cheese, or even French toasted! When treats this good are this guilt-free, the options are endless! 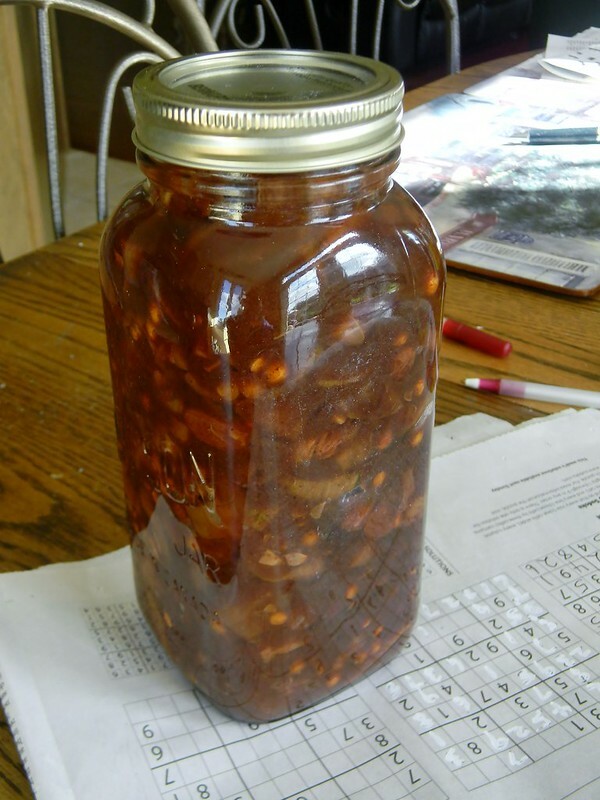 Each year, I get the chance to have my very own "Christmas in July (or August)" when I fire up the stove, canner and food processor to make that year's holiday mincemeat. Mincemeat is definitely one of those "love it or hate it" foods - I personally don't like intensely rich, dark, sticky medley of dried fruit, molasses and heady spices - especially when blended with savoury components (as I've said before, I'm not a fan of "fruit + anything". My parents, grandparents and aunts and uncles are all huge fans of the stuff, however, and for some reason I'm able to make better than storebought versions myself each year, despite changing the recipe based on that season's glut of produce. While I'm never lacking for filling when tart time comes around, there also never seems to be quite the same volume in the container of my "freezer" batch between August and December... I'll just have to blame our house gnomes (you know, the same ones who steal single socks out of the laundry). More than just planning ahead for the holidays, though, making mincemeat is my way of continuing my mom's holiday ritual of gift-making for my dad back when they were married. The whole process is something extremely comforting, the pot emanating aromas with the power to evoke memories of the many years I spent making tarts at my mom's side and spark that little childish thrill I still get from "playing magician" in my spice cabinet. Watching the overflowing pot of produce cook down into that thick, spoonable black gold is nothing short of wonderful, especially since it's the first taste of holiday glory (without the need to bust out the snow shovel and snowsuit). This year's mincemeat, as the title implies, is the perfect thing to use up a glut of zucchini / summer squash from the garden (which we obviously have). Laced with rum and given the extra twist of well aged, sweet and tangy balsamic vinegar, I added raisins, prunes and cranberries for texture and their slight thickening power as they soak up the fragrant, flavourful liquids. In place of tree nuts, I tossed in a handful of lentils, which also helped thicken the pot but added a rich earthiness of their own too. I canned two thirds of the batch for use in the new year (or as a Christmas in July ingredient next Summer), but froze the remaining third in a vaccuum sealed bag for easy "grab n' go" filling at holiday time. I think it's kind of funny that the end of Summer break snuck up on me. It's not too surprising, given that I've been working the Summer school / camp program since the beginning of July and as such didn't experience the definite "break" most of the students (and many of the teachers) did, but the realization that there's only a week left of camp before school "set up" begins still made me do a double take. All I can say is that thankfully I don't have to plan months of lessons in advance, or do much of the administrative stuff my superiors at school do - I'm actually still waiting on confirmation as to what my role will actually be next year! With my relative freedom after camp lets out for the day, I've been doing some planning and preparation of a different kind: weekday meals! Lunches have always been relatively standard on my end, but early mornings demand on-the-go food I can easily toss into my bag for the commute if (read: when) I sleep through my alarm in the morning. I've never been one for "savoury" breakfasts (even scrambled eggs, home fries and bacon get lashings of dark maple syrup here), but since pancakes and oatmeal can be a bit messy in the car I settled for the next best thing - breakfast cookies. 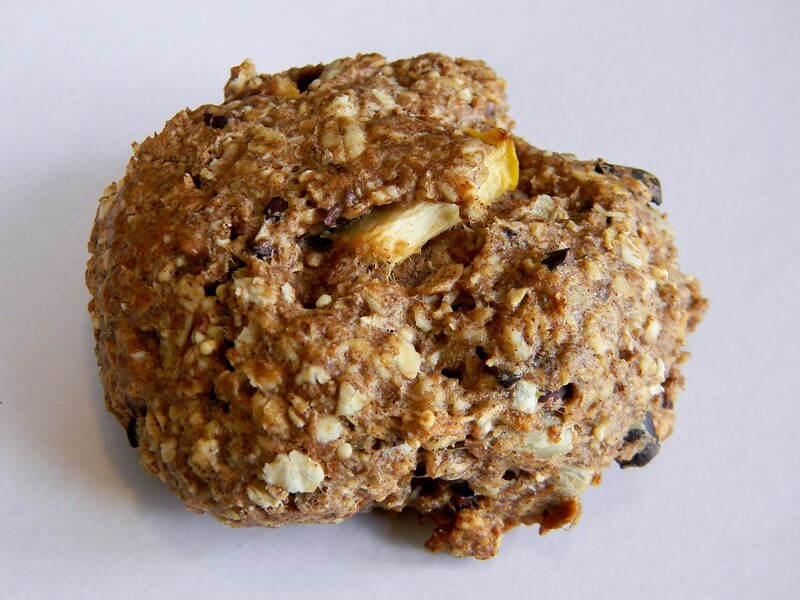 These hand-held, sugar free bites of bliss have it all: Amoré Almonds + Dairy beverage, multigrain cereal, oats, flaxseed and protein powder make up a "powered up" base peppered with diced apple and a seed mixture. Hearty but not heavy, they're the perfect size to get you to lunch without thinking about the vending machine or cafeteria - and if you do find yourself a bit peckish mid morning a second one won't derail your healthy eating mantra either, since each cookie is under 150 calories! This week's #SundaySupper is helping everyone gear up for school once again. Check out all the fabulous recipes and make sure to say hi! Apple Oat Breakfast Cookies from What Smells So Good? It surprises a lot of people that in a previous life I was a total meat-aholic. In particular, I loved all the "end bits" left over from a dinner mom would cook - the cartilage, fat, skin and (in particular) bone marrow of that night's chicken, pork chop or steak were beloved treats, and things like oxtail soup were high on my "like" list (I always wanted to try beef heart before getting sick, too - not so much now!). Vegetables? I could take them or leave them, really, unless drenched in a sauce of some kind or smothered in salsa, hot sauce or lemon juice. Of course, now the tables are drastically reversed! I crave and covet veggies above all else, finding I like ones I never considered before and loving the various configurations they can be formed into. with our recent glut of zucchini, I've been making zucchini boats with various things, but when we had some truly epic-sized beasts come in I turned to the internet for more inspiration. It was good ol Mr. G that reminded me that large summer squash are often called "marrows" (although "real" marrows are a different veggie), and that label got it into my head to try a different type of stuffed zucchini variation: mock marrow bones. A trip to a few farmer's markets turned out to be gold for inspiration and sourcing what we didn't grow out back, too. Leeks, kohlrabi and celeriac joined the freshly-picked haul of eggplant, beets, carrots, herbs, arugula and summer squash, which I then rounded out flavour-wise with lentils, sun-dried olives, tomato paste and white wine. Finally, I took a peeler to a wedge of Parmigano Reggiano cheese for piquant ribbons that browned ever so slightly in the oven, making for a vegetarian main or elegant side dish! If you need this to be vegan / dairy free, I'd suggest a dusting of ground almonds or panko for that little bit "extra". Since the zucchini overload in the garden still won't let up I (and my food processor) have been forced into almost constant "shredder" duty. Bags and bags of the stuff have been packed into Ziplocs and stashed in the fridge for later baking, but I'd be remiss is I didn't make at least a few treats along the way! While the classic spice and nut versions of zucchini bread are delicious in their own right, there's no better way of ensuring a recipe hit around here than by packing in as much chocolate flavour as possible. Not just cocoa, not just chocolate chips, but both plus the divinity known as Nutella found their way into the bowl this time, with homemade ricotta and apple butter for rich moisture and an almost brownie-like texture. 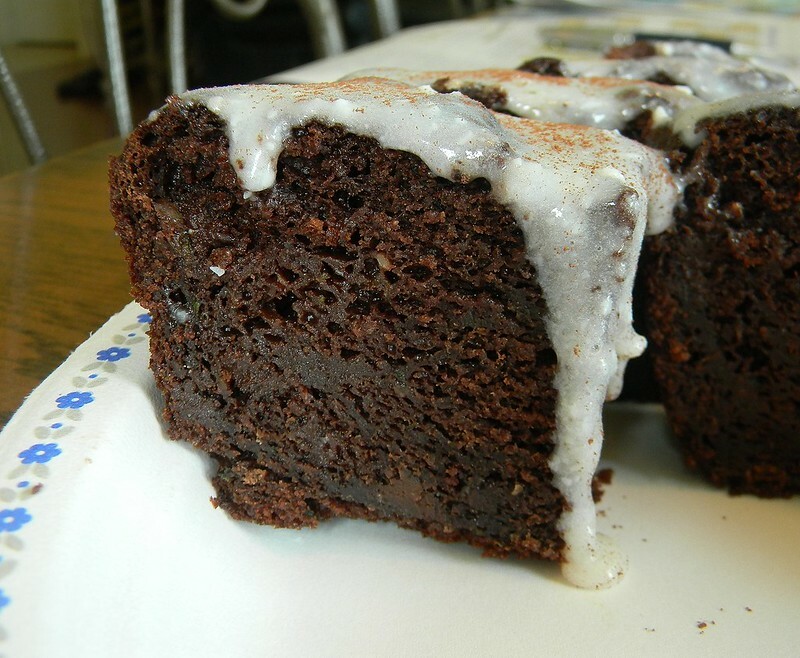 While it's not overly sweet, it's the perfect dessert for bittersweet chocolate fans and picky kids alike, that just so happens to contain whole grains and almost a pound of zucchini! Even though the loaf needs no accoutrements, I couldn't resist and made up a quick cream cheese glaze too. Hey, whoever said eating your vegetables had to be a chore? When I say "tortillas", what comes to mind? A lot of people probably say (quite correctly) that tortillas are (im)perfectly round flatbreads of corn or flour combinations ready for stuffing, a la Mexican style food. 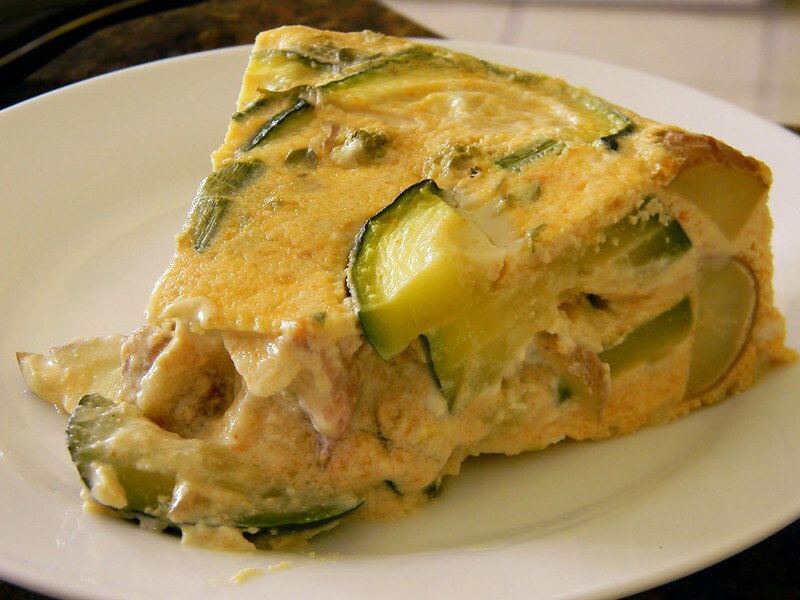 However, there is another type of tortilla out there that is totally unrelated to bread in any sense, and is in reality closer kissing cousins to quiche and fritatta - fitting, since this eggy dish hails from Spain, a stone's throw from France and Italy. 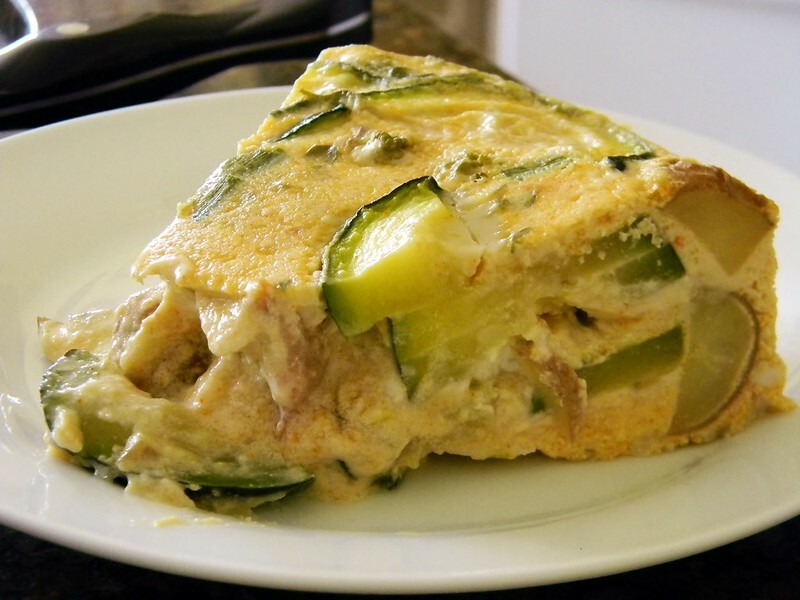 While there are a lot of variations on the Spaish tortilla, the two constant ingredients are eggs (obviously) and potatoes. Without a crust like quiche, the potatoes add a nice bit of "body" to the dish and are usually shallow fried in olive oil before assembly, adding extra texture. Anything else is really fair game, keeping in mind that "harder" veggies like carrots do better finely diced and cooked through and everything tastes better with a bit of sauteed pan-flavour. Since we have such a glorious array of garden bounty (including more zucchini than even soup can take care of), I took inspiration and packed ours with the harvest. I had a carton of egg substitute kicking around (we had bought it for something back at Easter, never made it and froze the carton) so that made up the bulk of the eggs, enriched with a luxurious splash of cream and pops of local chèvre and prime chorizo. Now, traditional tortillas rely on copious quantities of olive oil for frying potatoes and other ingredients, but since I had the cream I wanted to play a bit nicer with the rest of the fat quantities. 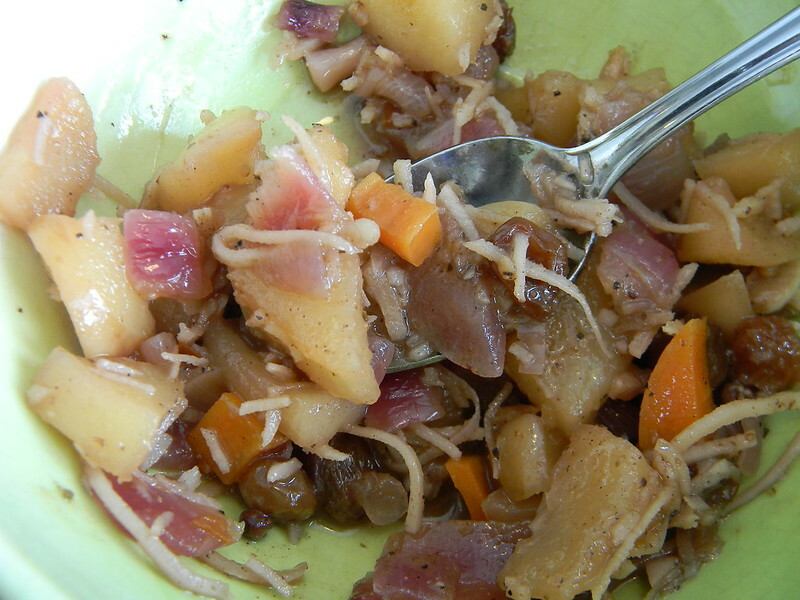 Instead, I steamed the red-skin new potatoes, and sauteed the remaining items in a hint of good quality olive oil. Lacking a decent oven-safe saute pan, I wrapped my best 9" springform up in foil and simply transferred the egg-coated mixture to it. A slice is definitely a full (and filling) meal for lunch, especially with a slice of garlic toast on the side and a nice wine (or sangria!). Without the chorizo, the dish is a vegetarian delight, and regardless the whole thing is gluten free too! Pretty much everybody who knows anybody with a garden has an abundance of zucchini in their fridge or on their counters. My family not only have one Summer squash plant growing in our backyard, but 6 - four standard zucchinis and the two heirloom pattypan squash I started from seed this Spring. We also have garlic from last year's planting, my Egyptian onions, yellow carrots and Lutz beets, the Romano beans and a host of other goodies, all of which are being consumed with relish. Of course, our backyard produce goes hand-in-hand with what we buy at the farmer's market now that the season is in full swing - meaning that I got a bunch of local garlic, peppers, tomatoes and berries for an absolute steal last week! As much as we love our veggies in everything, even my family can't combat the sheer volume of zucchini we've been pulling from the garden. It seems that every day a new, not-that-modestly sized log of squash finds itself on our kitchen table, eventually making its way into the fridge alongside it's older comrades.There's only so much ratatouille, stir-fry, omelettes and zucchini bread one can tolerate, so when I came across a soup recipe on The Kitchn that used up 1 1/2 lbs of the stuff in one fell swoop (along with a ton of our local garlic), I got chopping! One of the major reasons I was drawn to the recipe was the potential for extra garlicky goodness in my bowl, not to mention it's a creamy puree without a smidgen of dairy! I bumped up both the garlic and zucchini content to meet my needs and wants, both of which played rather nicely with the "green" flavours of camelina oil and Egyptian onions. Packed with flavourful nutrition, a bowl of this more than satisfies a rumbling stomach after a round of golf (or weeding the garden). That said, my mom did crumble some leftover bacon on top and deemed it equally delicious! Sunday Supper has partnered with The Beef Checkoff this week, and while I can't "officially" participate (darn those US only regulations :-)) I thought that in spirit, I'd bring the beef too. Now, my family are not generally big beef eaters - my stepdad and stepbrother might go for a steak or a double burger occasionally (especially if the only other option is chicken), but my mom really could take a pass over the "cow" section of the supermarket without much of a second thought. We do love spice, though, and my mom is a huge fan of exotic combinations or multicultural offerings. Even though my mom doesn't need to tote her lunch to work anymore (except for those few days she volunteers at my school), she still loves being able to pull something out of the fridge or freezer, stick it in the microwave and call it a meal. This is a bonus for me, since I love making her meals as much as she enjoys eating them, and it's a great way to not only have blog "fodder" and use up stray ingredients from the pantry, fridge and garden, but to expand my savoury cooking experiences beyond the usual "safe" meals I make for myself each night. 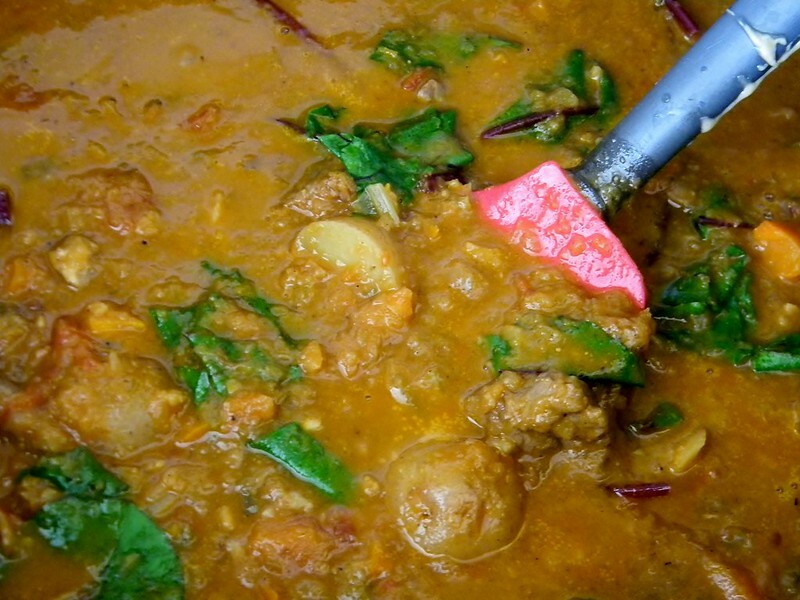 When my mom mentioned that she was in the mood for a spicy, peanutty stew akin to one she had at a restaurant a while back, I got to searching and found this one from The Kitchn. What I particularly liked about it was that it didn't need a lot of red meat to pack a punch, rather a small cut of chuck left over from our butcher's trimmings acted as one member of a flavour symphony. I definitely took the idea behind the original stew and added my own flair, loading the pot with local onions, potatoes, and garlic, plus hot peppers, scallions, carrots and beet greens from our garden. Extra spices added another layer of complexity, while a sizable dollop of peanut butter "hides" the heat at first bite, allowing it to sneak up and deliver a delicious kick in the end! Are you a beefaholic? Check out The Beef Checkoff in one (or more) of the myriad ways below! I can't think of a Summer road trip my family took that didn't include at least one stop at a doughnut shop. Originally, the only joint along our 2 hour drive north was a (relatively seedy) gas station / coffee shop that reeked of fumes from both the trucks' exhaust pipes and years of cigarette smoke that infused into every molecule of the place. Later on, Tim Hortons became more common and soon my sister and I would get to choose a mid morning treat as a "reward" for not killing each other for the last hour. Almost always, our tastes would run to the chocolate-based items, while my mom favoured the "healthier" berry and bran muffins. My dad, though, loved his old fashioned doughnuts. Without much to hide behind, the dense crumb is a perfect marriage of sweet and "starch", with the merest whisper of nutmeg. 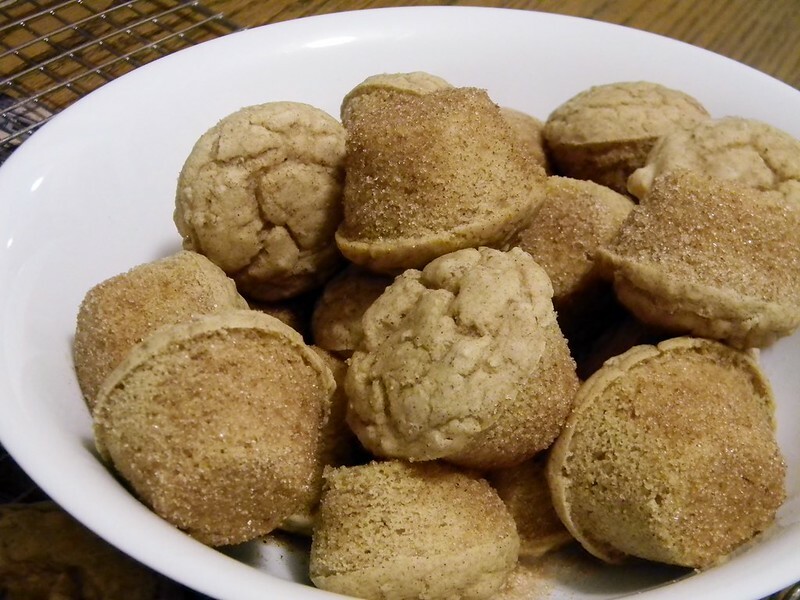 While I don't think I'd opt for a full doughnut in that style, the doughnut holes rolled in a cinnamon sugar crust were definitely enjoyed when I found them in a snack pack! Of course, all those treats were packed full of refined wheat, egg, dairy and sugar, not to mention they were deep fried. While they were devoid of everything nutritionally, they did contain liberal lashings of happy memories and an addictive personality. It's almost impossible to stop at one, which means each 70-ish calorie bite adds up quickly! I wanted to see if I could turn those sweet gems from my childhood over to the (slightly) healthier side - not just by baking the "TimBits" (baking any doughnut is de rigeur in my kitchen, since I'm terrified of hot oil), but by attempting a gluten free, eggless batter that also had a touch of protein, fibre, flavour and texture from the still-current darling of the nutrition world: quinoa. Originally, I was hoping to use red quinoa in these "TimBits" (really glorified mini-muffins), but my local bulk store only had white in stock. No matter the colour, adding the pre-cooked quinoa definitely elevated these babies by giving them a lovely "nutty" flavour (which paired well with the camelina oil too) as well as the hint of texture I was going for. Knowing I'd be rolling them in a cinnamon sugar crust, I added some cinnamon to the batter, and while the recipe stayed sweet I eliminated refined sugar altogether with a combination of cup-for-cup stevia and coconut sugar on the inside and raw sugar on the outside. They are definitely still their addictive little selves, and wouldn't be out of place on any car ride (or in a Summer camper's lunch! ).